Residents want the store closed. 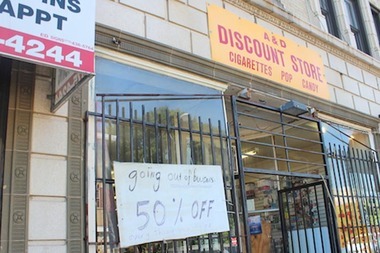 But low-cost cigarettes — in some cases $1 for a flavored pack — brings in unruly customers who hang out inside and outside the store, other businesses on the block say. Some believe a recent shooting involved men who had dealings at the store, but police have not confirmed a motive. On Thursday, clerk Jihad Shihadeh told DNAinfo Chicago that the building owner is forcing them to leave. A "going out of business" sign was posted in the window. The closing can't come soon enough for Ald. Roderick Sawyer (6th). “I can’t say I’m sad to see them go,” said Sawyer, who nevertheless was skeptical the store would actually close. Sawyer said that he has repeatedly reported the business to the city's Department of Business Affairs and Consumer Protection. “We have sent [them] over there on numerous occasions,” he said, although the store’s business license has yet to be revoked. “I don’t like the fact that they have people hanging outside the store all day, every day,” he said. 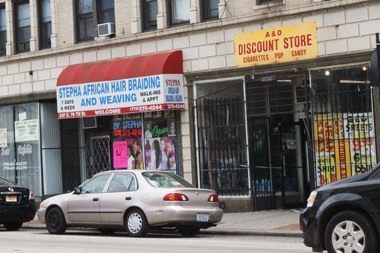 City records, obtained by DNAinfo Chicago through a Freedom of Information request, show the store has been cited repeatedly by the city for selling cigarettes to minors, not paying sales tax on cigarettes and not posting warnings about the dangers of cigarettes. The store was also cited for not maintaining records of tobacco sales or having proof the cigarettes were bought from a wholesaler. In addition, Shihadeh repeatedly refused to allow city workers to inspect the store or the safe where unstamped cigarettes were kept, records say. Unstamped cigarettes are untaxed and are typically brought into the state illegally, city officials said. The violations occurred as often as once a month, documents show. “Concealed 107 packs of cigarettes on a hidden shelf,” one inspector wrote in a report last year. In other instances Shihadeh allegedly slammed the safe shut when the inspectors arrived. inspection,” one of several rulings from the Department of Administrative Hearings reads. Other violations not involving tobacco include not giving receipts to customers, not putting price tags on items and selling outdated food. In the visit to the store last week by DNAinfo Chicago reporters, no pricetags could be seen on any items. Shihadeh declined to say whether the store’s closing was related to the city citations. He referred questions to store owner Adli Said, who Shihadeh said wasn't available. The store was ordered to pay nearly $2,800 in fines in 2013 and $21,000 in 2014. An administrative law judge issued another $6,700 in fines at a hearing July 21. Calls for the store’s closure heated up after a shooting that took place July 9 near the store. Joseph Gaithers, 35, of the 6300 block of South Calumet Avenue, was talking to someone around 1:15 p.m. on the 8000 block of South King Drive when he was shot in the back of the head, police said. He died a few hours later. Gaithers was a known gang member, police told the Tribune. No one was arrested in the case. Worlee Glover, a member of Concerned Citizens of Chatham, said people have told him that the shooting involved men who have dealings with the store. Police have not given details of who was involved. Shihadeh declined to comment on any of the allegations made by community members. Glover said residents also don’t like the store there because of the number of people who loiter outside of it. Flecks Coffee used to be next door on the corner, but it closed in November and Glover said he believes the crowds of people outside A&D Discount scared away those who otherwise might have gone to the coffee shop. Glover has also heard about the cheap cigarettes. “People are trying to figure out how the guy is selling packs of cigarettes for $7 when the average price in the city is $12 a pack,” he said. Abdul Rauf, a manager at Quality Scents, 323 E. 79th St., said after the shooting that customers told him they are “nervous” and “scared” about shopping on 79th Street. They rarely linger after making their purchases. Sawyer said he has asked the Chicago Police Department to patrol the area more.